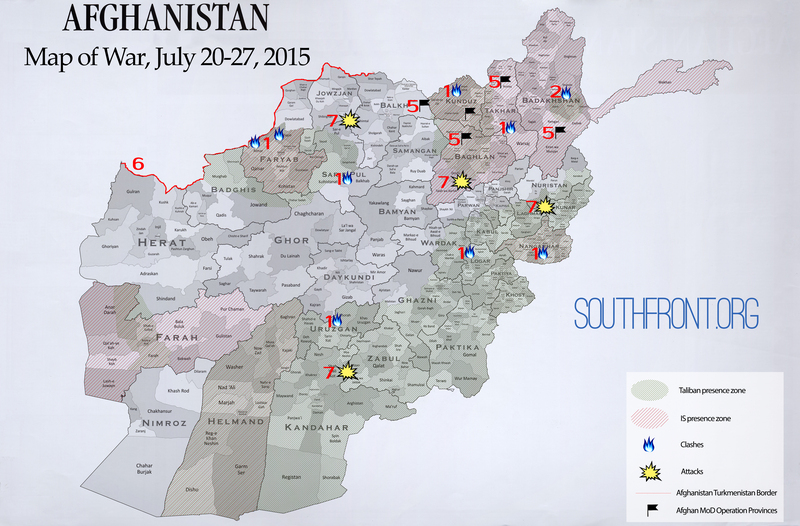 Afghanistan Map of War, July 20-27, 2015 5 out of 5 based on 1 ratings. 1 user reviews. The Kabul government is preparing for a big advance in northern Afghanistan. National Security Forces have been involved in intense clashes with the Taliban in 7 provinces. At the moment security forces have gained round only in Faryab province. The Taliban has now started a new offensive in the Badakhshan province by taking control of the “Kala” military base, seizing several checkpoints and capturing 100 pro-government fighters. Islamic State has also participated in clashes at the Afghanistan-Turkmenistan border. July 20-27, The operations of Afghan National Security Forces against the Taliban are underway in 7 provinces of Afghanistan. The attacks on the positions of militants were performed in Takhar, Kunduz, Faryab, Nangarhar, Sar-e Pul, Uruzgan and Logar. The Afghan Ministry of Internal Affairs reported government forces killed 20 and detained 2 militants. Also, a serviceman of the Afghan National Security Forces was killed. The most intense clashes were observed in Kunduz, Nangarhar and Faryab (on July 13, Taliban forces captured 22 checkpoints and over 40 settlements there). At the moment, Afghan National Security Forces have liberated a part of the Faryab province and destroyed 2 Taliban bases in the Almar district. July 24-25, Taliban militants along with the “Unity of Islamic Jihad” took control of the “Kala” military base in the Wurduj district of the Badakhshan province. 25 Afghan servicemen were either killed or wounded, 100 were taken prisoner. Militants captured 10 Kalashnikov LMG, 90 assault rifles, 2 mortars and some other equipment. The Taliban stated it had taken control of 6 check points and 12 settlements around the military base. However, this information wasn’t confirmed by Kabul. Earlier, the acting governor of Badakhshan Shah Wali Adib was alarmed by the situation and asked the central government to send reinforcements. July 26, The chief of the Badakhshan police General Abdul Wahid Baba Jan accused captured “Kala” servicemen of making a secret deal with the Taliban. According to him Kala servicemen had enough arms and equipment to defend the military base, but they preferred to make a deal with militants. July 27, The Taliban released the 100 servicemen captured after taking control of “Kala”. The event confirms that General Abdul Wahid Baba Jan’s allegation that they didn’t try their best in clashes against the militants. At the very least, it indicates low morale among the Afghan forces. July 27, The Ministry of Defense of Afghanistan has been preparing a military operation in the northern part of the country: Badakhshan, Takhar, Kunduz, Balkh and Baghlan. The operation is a result of numerous reports from localized pro-government forces about the lack of support from Kabul. July 1-27, Islamic State has been advancing at the Afghanistan-Turkmenistan border since early July. 3000 to 4000 of IS militants are concentrated in the region. According to official reports, at least 12 border guard servicemen were killed there. Different reports state a number over 80 Turkmenistan servicemen killed. It’s possible that Islamic State is there is to capture gas fields of Turkmenistan. Despite Afghan government’s official reports that clashes are underway in 7 provinces, there are much more zones of military activity in the country. The Taliban has partly taken control of other Afghan provinces too. Attacks on military servicemen and policemen constantly come around the south, east and central regions. 4100 Afghan National Security Forces servicemen were killed and 7800 wounded since the start of 2015. Kabul’s big advance in the north is a reaction to numerous requests of local authorities and an overdue attempt to get the situation under the control. However, the events in the Badakhshan province on July 24-25 indicate that government forces have most likely been losing the will to fight against the Taliban. The increase in IS activity is synchronized with signing of The Iran Nuclear Deal and is clearly pushing the USA’s interests: to prevent the supply of Turkmen gas to China (through TAPI or Uzbekistan) and redirect the flows to the Europe. Iran will replace Russia in energy supplies, enforcing the USA for further anti-Russian actions in the central Europe.